Want to freshen up your carpets with steam cleaning? Continental Carpet Care, Inc. can help. We've been providing homeowners and businesses in Clearview Washington with quality carpet steam cleaning at an affordable price since 1989. Steam cleaning is generally accepted as the most effective method of cleaning carpets. Our powerful cleaning system provides a power application of hot water and cleaning solution to dislodge embedded debris and dirt, which protecting your carpeting fibers. Regular carpet cleaning will improve your indoor air quality and beautify your home or business. All of the technicians at Continental Carpet Care, Inc. has been thoroughly trained in our tried and true methods for expertly steam cleaning your Clearview carpets. 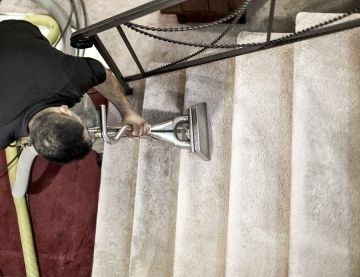 Each technician takes pride follow best practices to thoroughly clean your carpets and keep you satisfied. First, we'll complete a walk through and visual assessment of your carpeted areas and identify any areas that require special attention such as spots, stains or odors. These spots will be pre-treated in with the appropriate odor neutralizers and cleaning solutions. Next, your carpeting will be sprayed with a measured amount of effective solution and applied with hot water. Our powerful extractors will then remove almost all of the water and cleaning solution so that the carpets will dry within just a few hours. All we will leave behind is clean, fresh-smelling carpet. Why Call Continental Carpet Care, Inc. for Carpet Steam Cleaning in Clearview? From your first call to Continental Carpet Care, Inc. for a free quote until the moment our hoses are rolled up and we drive off into the sunset, you will be treated with respect and professionalism by our staff. Our carpet steam cleaning technicians are uniquely trained in meeting our high standards for thorough steam cleaning in Clearview with every visit. We take pride in improving the air quality and cleanliness of local homes and businesses in our care. What's more, Continental Carpet Care, Inc. can take the headache out of remembering to schedule carpet cleanings by setting you up on a carpet maintenance program. Your carpets will look great year round, and you can save money when you sign up!